Adopt a cute and mischievious Bush Baby today! Her eyes can wiggle and ears can waggle! 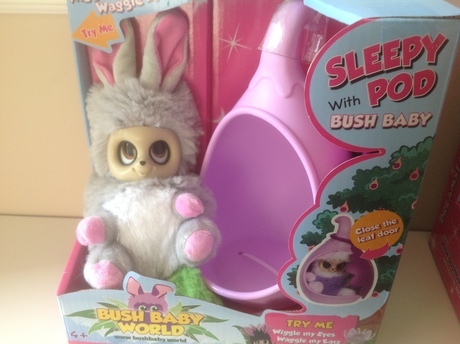 and the Dreamstar Bush Babies with Sleepy Pods have their own unique style and special place within Bush Baby World. The Bush Babies nurture and protect the Dream Tree and at night they snuggle into their Sleepy Pods and close the leaf door to stay cosy and warms. Soft and squashy, the Sleepy Pods have a hanging stalk so you can hang them on the Dream Tree or anywhere you wish.